The mission is simple: travel to Planet Earth, inhabit the body of an average teenager, and determine if the human race should be annihilated. 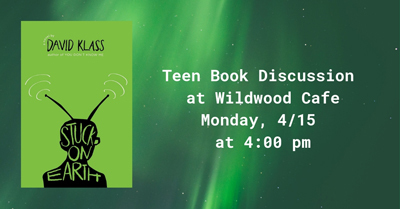 Join us discussing David Klass’s book Stuck On Earth an engrossing look at true friends, truer enemies, and awkward alien first kisses. For teens in grades 6 and up. Visit the 2nd Floor Information Desk for a copy of the book. This program is part of the month long celebration entitled The TARDIS Lands at the Library: A Celebration of Doctor Who. Visit the Stoughton Public Library for more details.